Christmas 2015 was a quiet affair spent with the Jones grandparents. 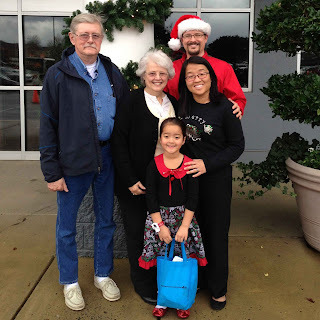 Katy was lucky enough to spend the whole week preceding Christmas with Nanny and Poppy Jones (Yay!) 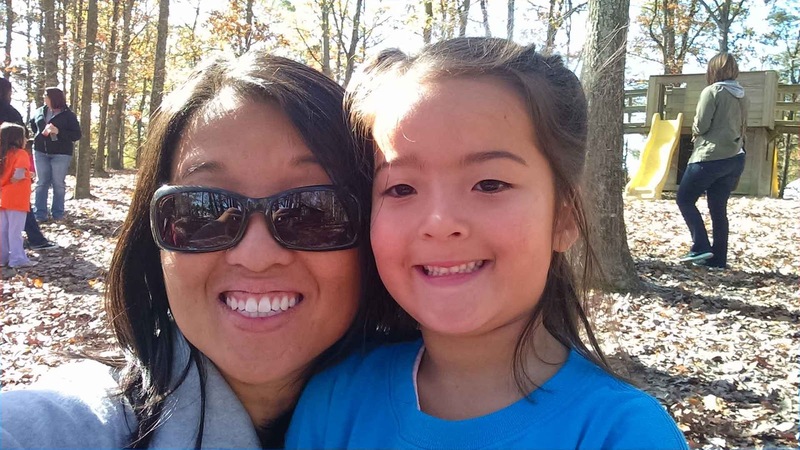 while Mommy and Daddy had to work (Boo!). 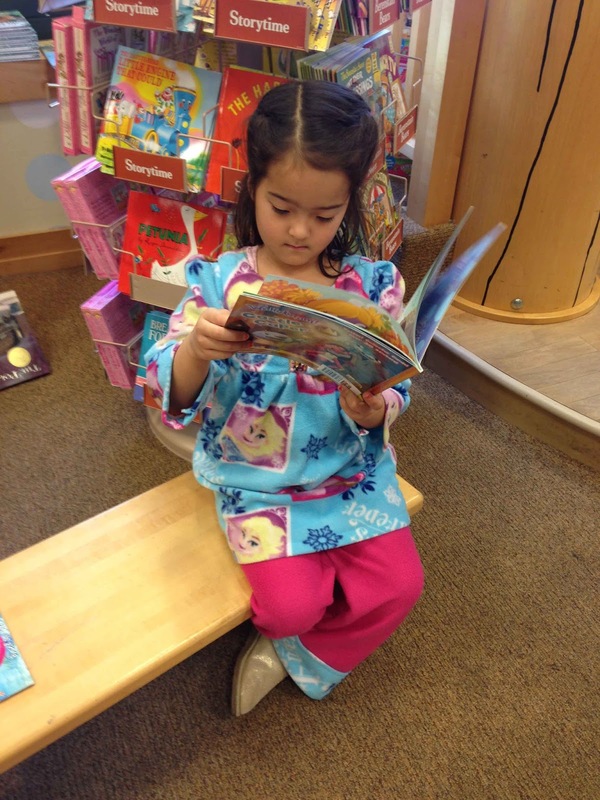 She got to go to the library, Painted Pottery and out to lunch with the grandparents. Lucky girl! We went to church as a family Christmas Eve. The 3PM service was packed at Elevation! After we came home from church, we enjoyed a fun, fondue dinner. Lil' Miss got to open gift Christmas Eve (always Pjs). 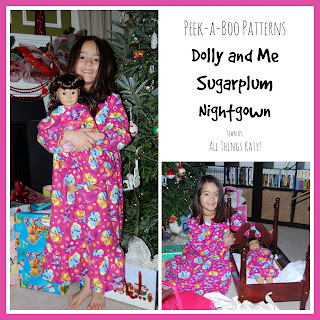 This year, though, it was a matching Dolly and Me Nightgown set for Katy and Samantha! (I swear, that doll is like a fourth member of our family- ha!). 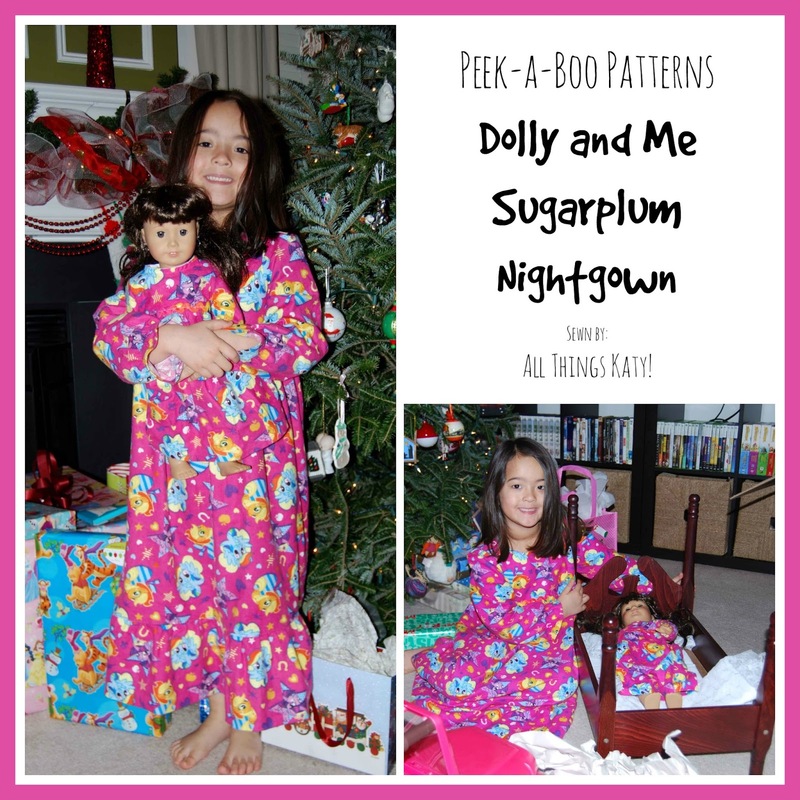 The night before Christmas, Katy was super excited! We told her that she could come down no sooner than 7:30AM Christmas morning. Unbeknownst to Ted and I, she woke the grandparents up at 1:30AM to go open presents. The funny part was, Nanny was almost ready to let her do it (until Poppy glanced at his phone and realized that it was only 1:30AM in the morning! ).Thankfully, they tucked her back in bed. Then, at 3:30AM, Lil' Miss was kind enough to wake Ted and I up, too. However, this time, Ted tucked Katy back into bed. Of course, when it was actually 7:30am in the morning (a decent time to wake up and open presents! ), Lil' Miss was fast alseep and sawing logs.... haahhahahahhaha! We finally got started around 8:30/9AM Christmas morning. Lil' Miss had a pile of presents to go through but she made quick work of it! She's a lucky little girl to have so many people in her life that not only shower her with gifts but love her through and through!! If I were to pick a theme for this year's Christmas, I'd say it was a very Merry Shopkins Christmas. (Christmas 2013 was brought to you by My Little Ponies, last year was Frozen Themed ;-). Oh, those tiny, characterized plastic figurines of food, clothes and other shop-able items....! Their pull alludes me but they are super, duper popular with the under eight crowd and Katy is no exception. She LOVES Shopkins!! Katy spent most of the day playing with her new toys. We ended the day with our traditional Chinese Take-out Dinner (no prep, non clean up- Merry Christmas to me!). 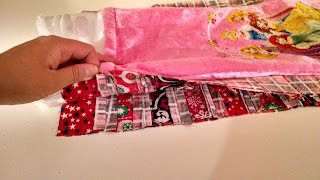 This was my first time creating a "rag" type anything so I was definitely out of my element when I sewed up my stocking (As you might know from reading through previous All Things Katy! 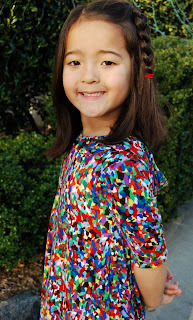 posts, I mostly sew clothing for my smart, beautiful, sometimes-sassy five-almost-six year old daughter ;). 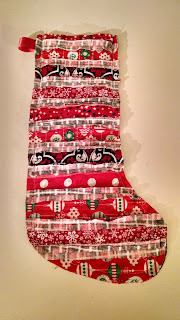 However, part of the beauty of learning to sew (and pretty much teaching myself), is that with each project, I get to learn something new, perfect old skills and gain new ones... such was the case with A Vision to Remember's Christmas Stocking Pattern. First, I need to state that this free "pattern" is more of a list of directions.... and, to be honest, I was a little intimidated and confused by the lack of progress pictures throughout the tutorial. Never fear, though, the online sewing community is a beautiful thing! With the help of some of my sew sisters (THANK YOU, Ladies! ), I was able to figure things out and get going. Once I figure out what paired with what- the stocking came together in no time! 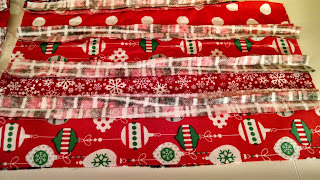 The first thing I need to state (to help others, like me, that might be a bit confused on how to start) is- sewing the A Vision to Remember's Christmas Stocking Pattern stocking is completely OPPOSITE of sewing a garment. For A Vision to Remember's Christmas Stocking Pattern it's WRONG sides together and the "hem" is facing out (that's what ends up being the fun, featured "ragged" element). After you cut out all of the strips, go ahead and lay things out. 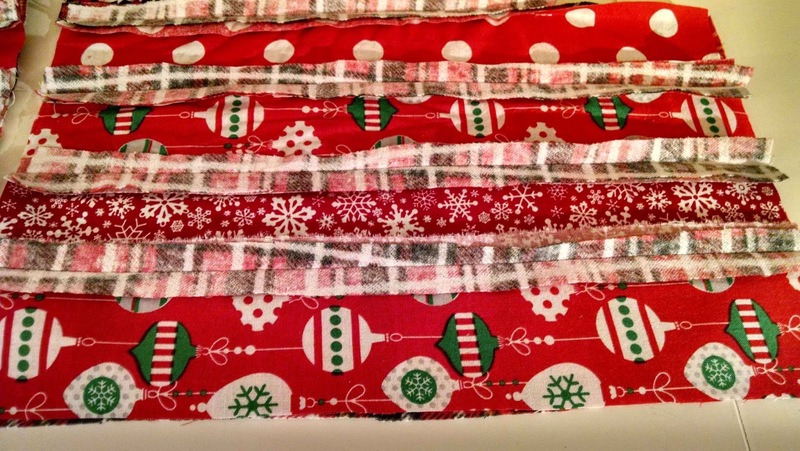 For every strip of fabric that you see in the picture, there is a matching sized piece of flannel sitting beneath it, face up (ie, the flannel and the fabric strip are BOTH facing up). This really helped me get a feel for the flow of patterns. Also, by laying everything out, I was able to presumptively make sure that I didn't accidentally create two left feet (pun intended). Be sure to make MIRROR images!!! 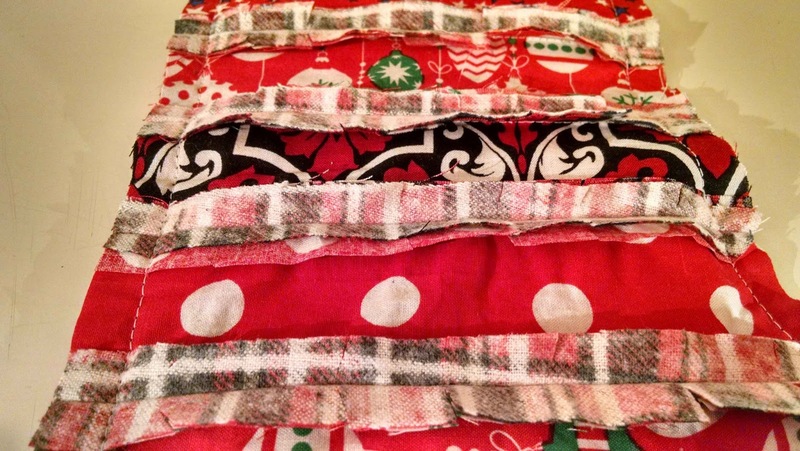 Lay out your strips of fabric/flannel. Make sure to make MIRROR images! 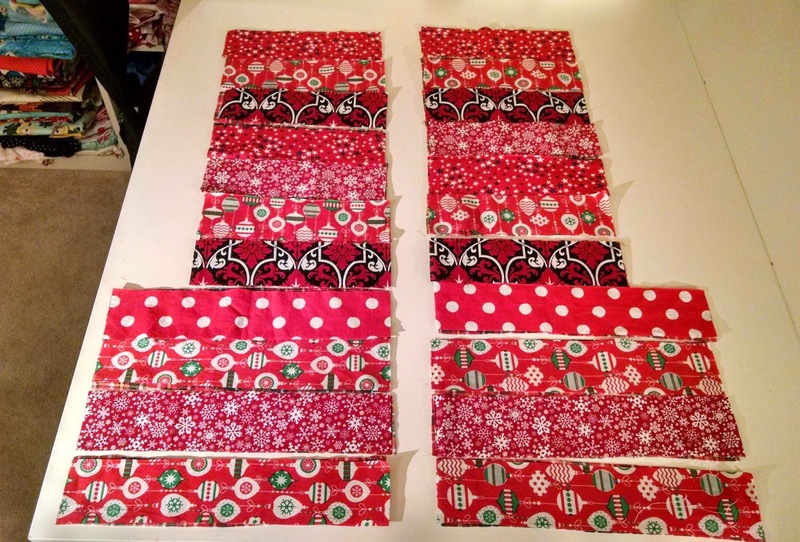 "Fabric Sandwiches" In this picture are two of the strips that I laid out in the picture before. It goes fabric face down, flannel face down, flannel facing UP, fabric facing up. Sew along the LONG edge and continue to do so until you have one big piece of sewn together fabric. Tip- the flannel creates the INSIDE of the stocking. How to assemble each strip and put them together. 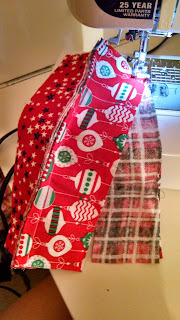 Once I figured out how to lay everything out, sewing up the stocking was breeze- just some straight stitches and I was good to go. Sewing all the layers together. Notice the cut hems. 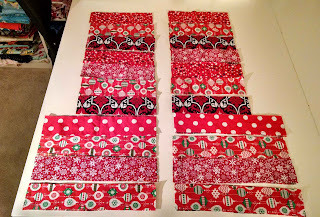 Around step 13 of A Vision to Remember's Christmas Stocking Pattern, it talks about "cutting" the hems with short blade scissors. This confused me at first. However, cutting the hems will make the edges more "ragged" after you wash them. Stocking BEFORE going into the laundry. Also, I slightly modified the pattern by just using a piece of ribbon cut to size for my loop (opposed to the instructed piece of fabric). It's what I had on hand and it made this project that much simpler to accomplish. 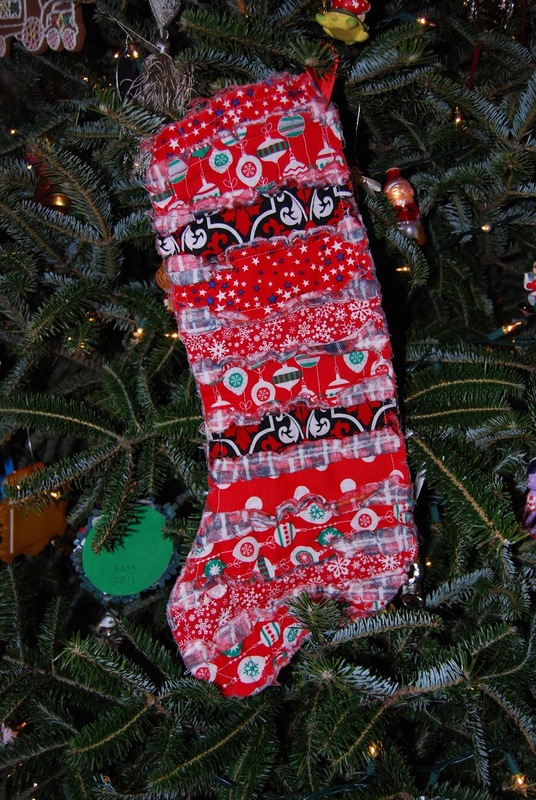 A Vision to Remember's Christmas Stocking Pattern Finished Product!! 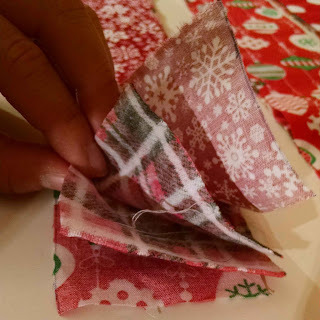 A Vision to Remember's Christmas Stocking Pattern is a great way to use up all those fabric scraps (admit it, sewist- you just *might* have a couple scraps laying around.... ;-). I did not purchase on fabric for this project. That's a super big win for me! Learn a new skill, save fun... #winning! 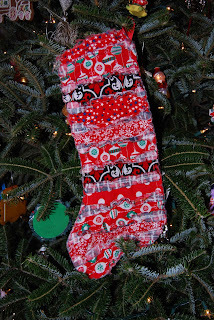 I love that I can look at this stocking and remember all the fun past projects that I've sewn up... some holiday pillow wraps out of the Christmas balls, a summer-y dress out of the black and white, a 4th of July outfit for Lil' Miss out of the stars, last year's Christmas dress for Lil' Miss out of the snowflakes.... Sew.Much.Fun! 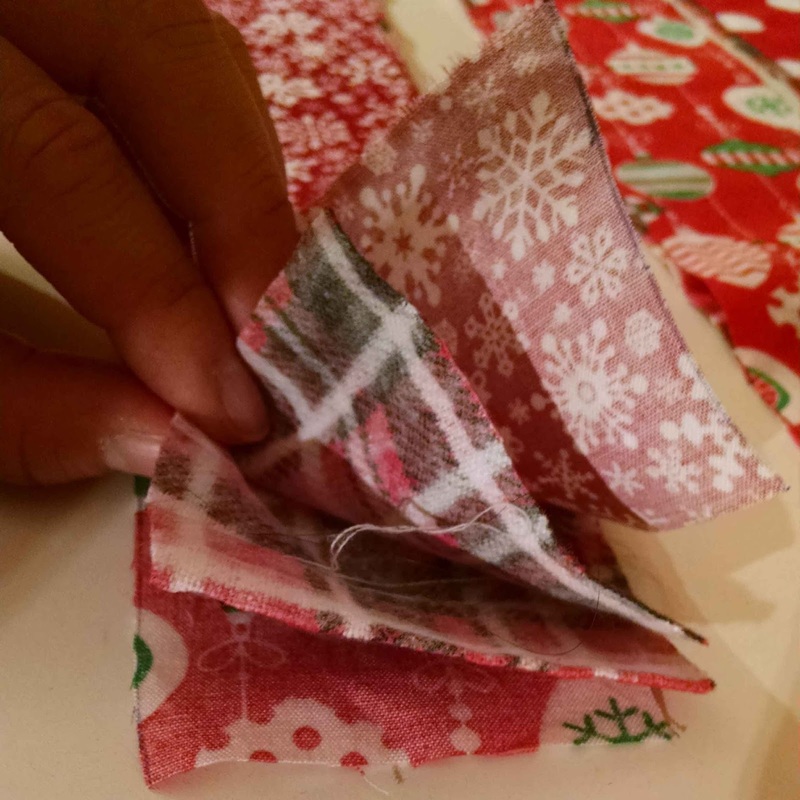 So, there you have it- a fun, slightly different (for me) sewing project to get you started (or finished) this holiday shopping/making season!! Merry Christmas!! Last Sunday, as part of her Christmas gift from us, Ted and I surprised Katy with Breakfast with Santa at our local American Girl Store. Reservations for this event were limited and we made them well, well in advance (ie, back in JUNE!). Then, while everybody was eating, Santa made his grand entrance. Now, the best part of the whole experience (at least from a parents' perspective) was the fact that Katy just assumed that just going to the AG store and having breakfast was the treat. 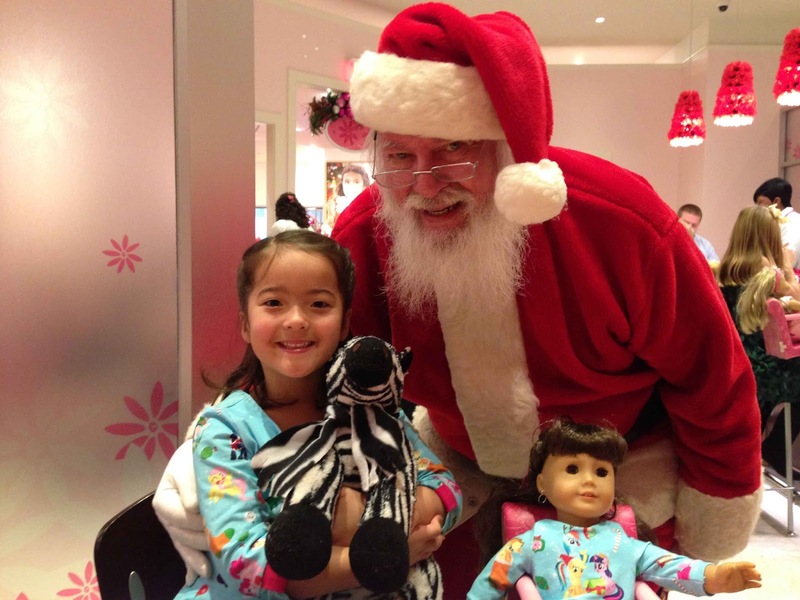 She didn't realize that she'd get to see Santa, too! When she realized that there was a special guest on top of everything else (breakfast, going to the AG store, etc.).... .well, let's just say that her smile could have lit up the moon...!! Santa made sure to stop at each table and have a little one-on-one time with each girl. 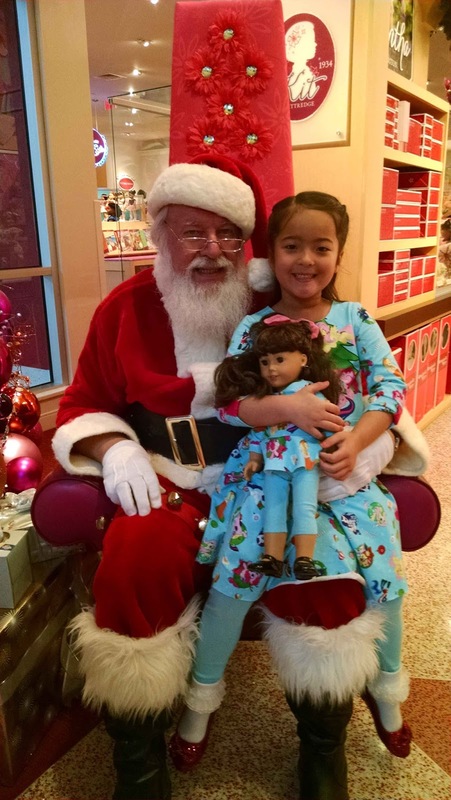 Breakfast with Santa occurred before store hours. That means that we (and the other guests) had the store all to ourselves for two whole hours. 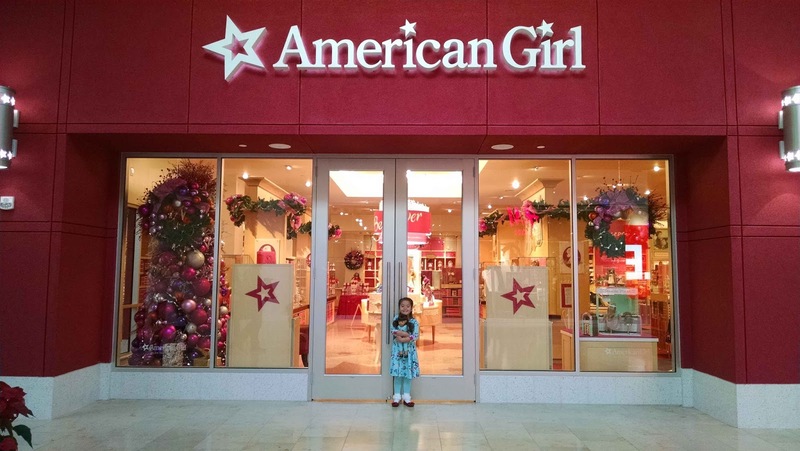 It was really nice to walk around the store leisurely and not be super crowded (especially around Christmas!). Katy had a blast looking at all of the set-ups and even inserting her own Samantha doll into some of the scenes. We had lots of fun eating Breakfast with Santa! It truly was a memorable experience (for both Katy and us!). It's been a little while, but I recently had the opportunity to test for Love Notions, again. It's been way too long and I really do love Tami's style and sizing! Up to bat, today- the Li'l LDT (Laundry Day Tee)! This easy fitting PDF sewing pattern is full of options and pairs perfectly with the Mama version of the Laundry Day Tee. -The Love Notions Li'l LDT is sized for 2t-16. 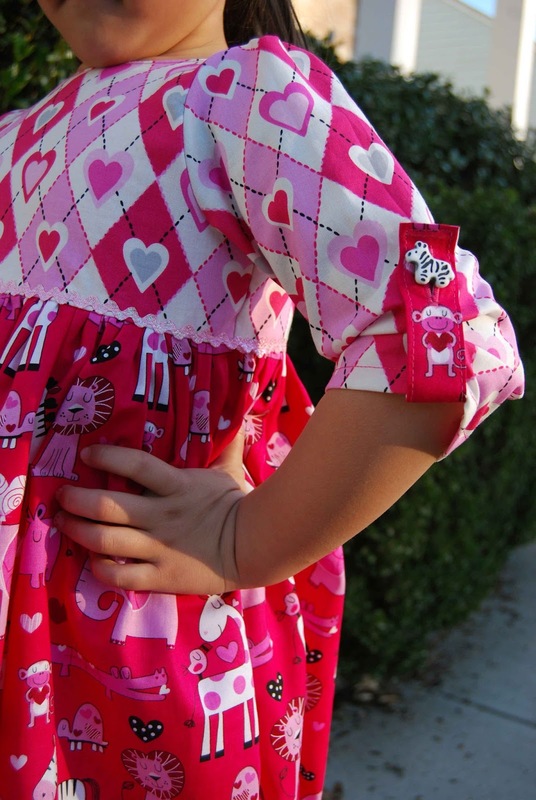 -The Love Notions Li'l LDT is meant to be sewn with knit fabric. Light to medium weight knits with at least 40% stretch, cotton lycra, jersey blends, ponte de roma, french terry or sweater knits are recommended. 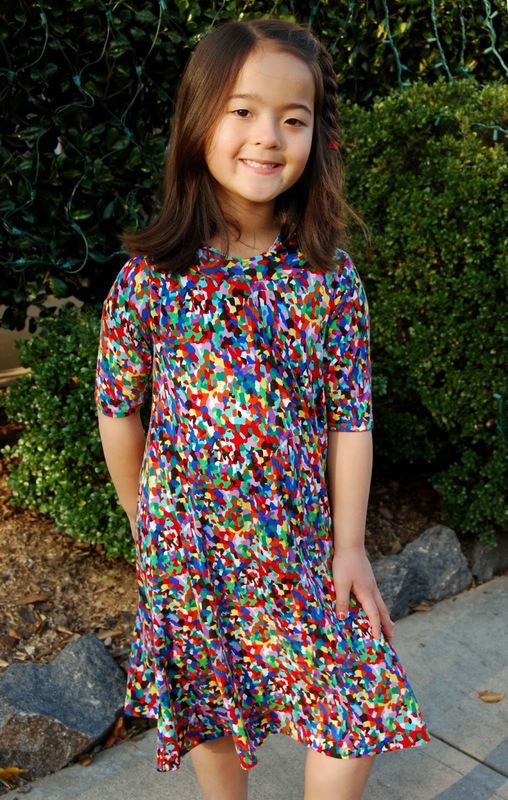 -The Love Notions Li'l LDT PDF sewing pattern includes three hem lengths- shirt, tunic or dress. There is even an option for a high/low hem for the tunic and dress lengths. -The Love Notions Li'l LDT includes four necklines- banded, cowl, gnome/regular hood, and asymmetrical collar. -The Love Notions Li'l LDT has five sleeve lengths- cap, elbow, 3/4 bishop, long sleeve, and tank. 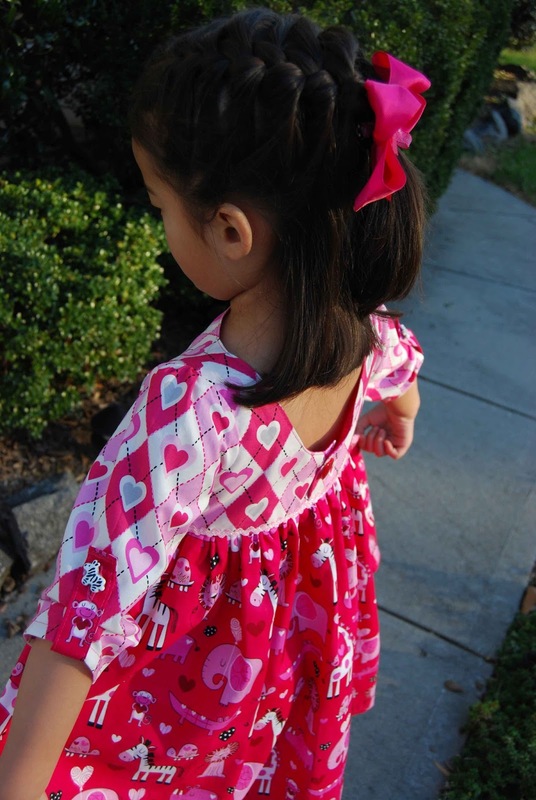 -There is even an optional pocket pattern piece included in the Love Notions Li'l LDT PDF sewing pattern. 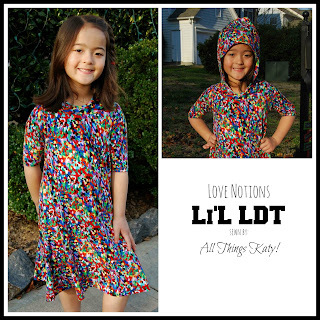 -The Love Notions Li'l LDT PDF sewing pattern includes a nested, layered, no-trim pattern pieces (my favorite!!). 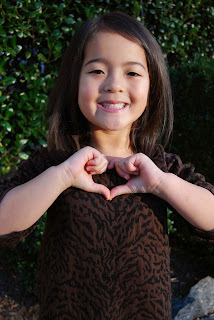 -The Love Notions Li'l LDT PDF sewing pattern includes shaded diagrams throughout the tutorial to guide and assist you in sewing up the perfect garnet for your little one. 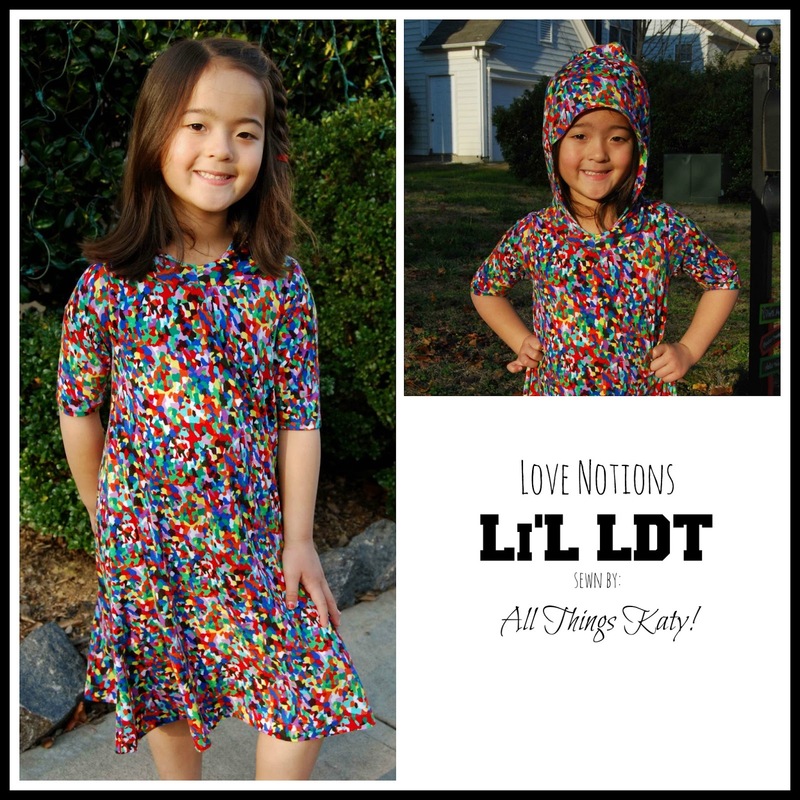 -The Love Notions Li'l LDT PDF sewing pattern includes a printing chart/diagram, fabric requirements chart, sizing chart and hyperlinks along the side to help troubleshoot. 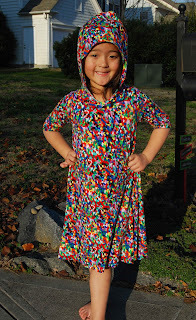 I sewed up a size six, dress length, elbow length sleeves with lined gnome hood. 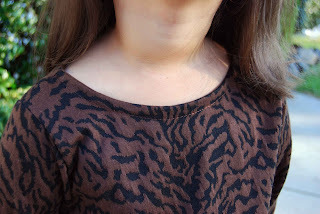 I used a lightweight jersey knit blend from the clearance table at my local Hancock Fabrics. One of the things I love about Love Notions patterns is the fact that the sizing is so accurate. I felt like the size six was a great fit for Katy's height and measurements. 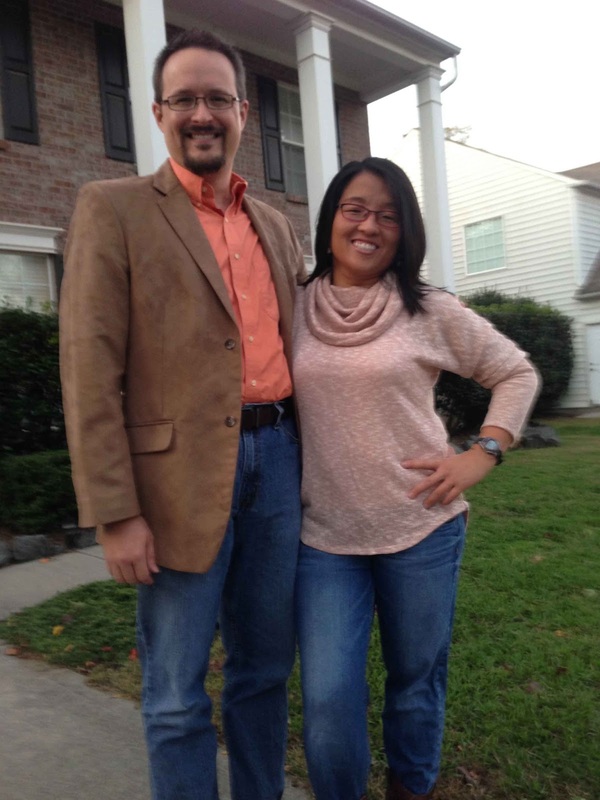 The elbow length sleeves hit right at the elbow and the dress length hit below the knees. 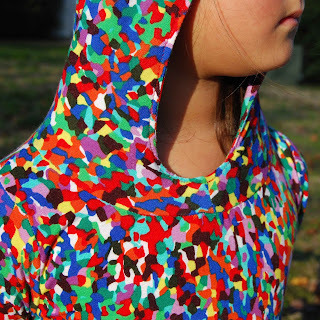 With the exception of the hood, I sewed everything on my serger. 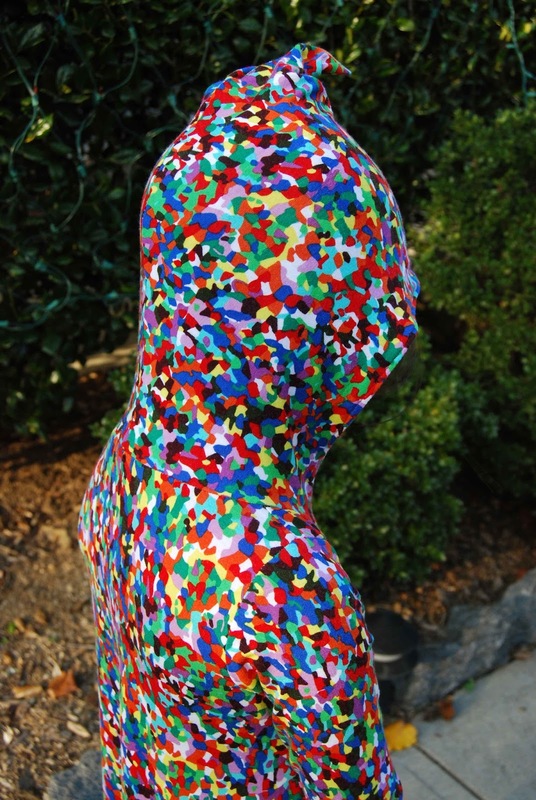 I chose to attach the hood to the dress with my sewing machine (using a stretch stitch) because I felt like I could get a little more control that way but that's totally personal preference. 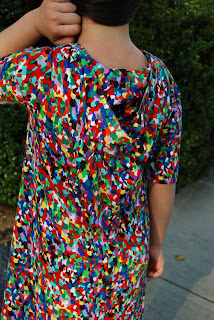 Because I used my serger and because this dress is in all knit (ahem- less ironing and pressing! 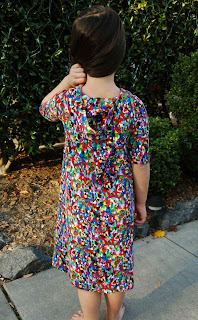 ), I was able to finish this dress in an evening. 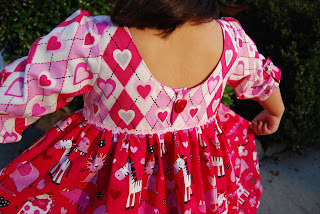 Love a great, quick sew! There's lots of ways to personalize the Love Notions Li'l LDT! 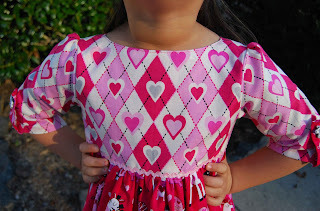 Seriously- with all the sleeve, neckline and hemline options- you could sew this pattern over and over and over again and still come up with something different every time. 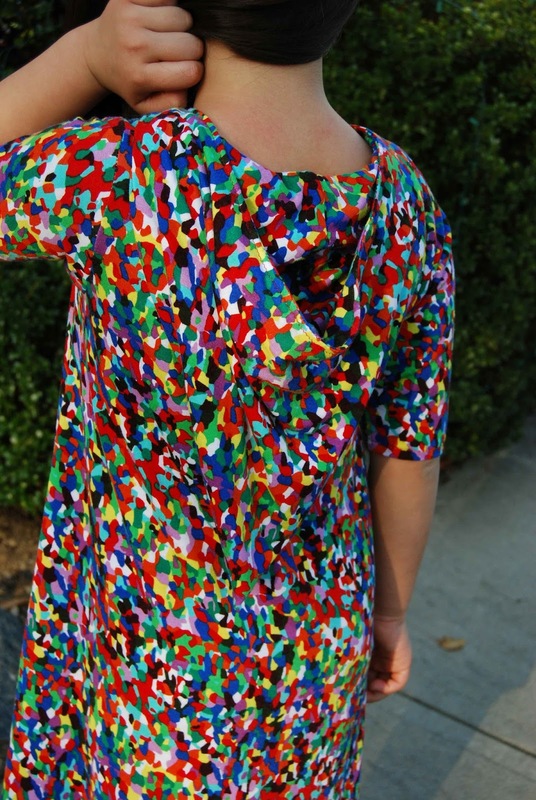 I love when I can use and reuse the same pattern for many different dresses/tops. Thank you, Tami, for allowing me to test another one of your patterns! I truly appreciate your style and talent. Now, I'm off to sew myself a matching Love Notions Laundry Day Tee....! 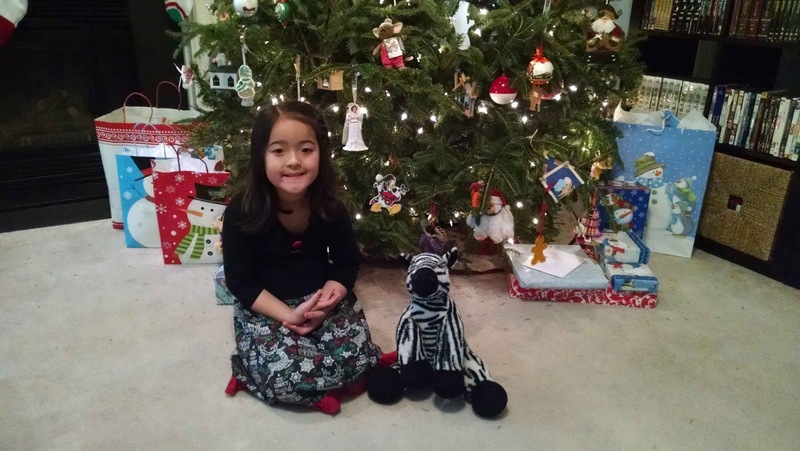 On Friday, Katy came home with the class pet, Zippy the Zebra. Each week, a different student is selected to bring Zippy home for the weekend and then document her adventures through pictures/drawings/writing. Katy was SO.EXCITED (!!!) to bring Zippy home, this past weekend!! 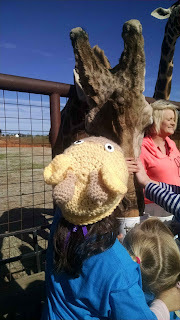 Friday evening, we went to PSRES Mistletoe Madness craft show to support my sew sister, Natailie and The Sassy Pumpkin. We ran into classmate, Shelby, while there. Zippy joined us at church, Saturday evening. She even got to go to EKids with Katy! 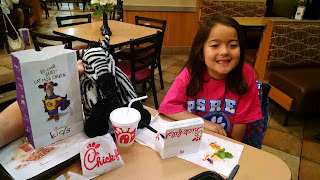 After church, we went to Chick-Fil-A for dinner. Zippy ordered a kids meal and gobbled it right up! ...and, because I couldn't help myself, I sewed up (with the help of Lil' Miss, of course ;-) a hat and scarf for Zippy. While Zippy certainly didn't need the scarf and hat this weekend with our unseasonably warm weather (72 degrees in mid-December! ), we hope she'll get some use out of it later this winter. 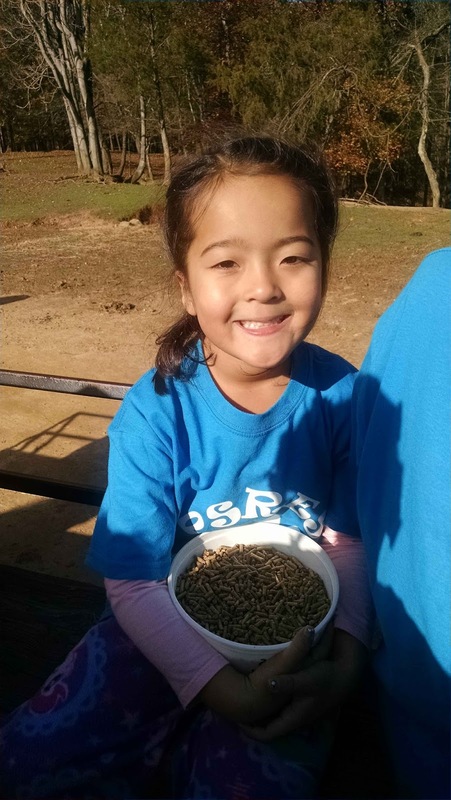 Katy had lots of fun with her class pet, Zippy, this past weekend! Last Friday, Lil' Miss had her Kindergarten Christmas program, followed by her class Christmas party. First, everybody assembled in the gym for the program. It took a bit of coordination (and patience!) to get 120+ Kindergarten students up on the stage but they finally made it! Then, the students proceeded to serenade us (the proud parents) with at least a dozen holiday songs. Katy sure sang her heart out!! Lil' Miss was also one of the six students selected to act out a snowman poem She was snow woman #5. 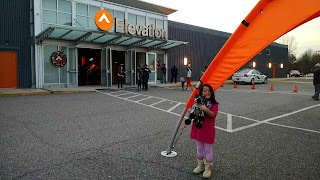 She did a great job getting in front of the big audience of parents and doing her part with viver! After the program, it was party time!! Now, I should note that I am room parent for Katy's kindergarten class, this year. 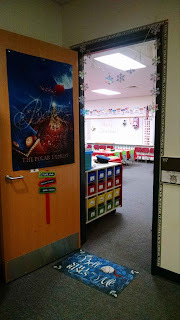 So, I was in charge of setting up, coordinating and organizing Mrs. Mitchell's Christmas party. It was no small feat- but it was a lot of fun and turned out pretty cute (if I do say so, myself ;-). The theme of the party was The Polar Express. 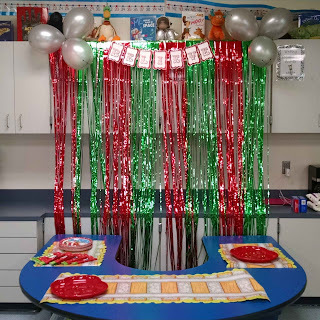 I came in the afternoon before to decorate the classroom in all things Polar Express (hubby's job sure came in handy in all aspect of planning this party!! ;-). 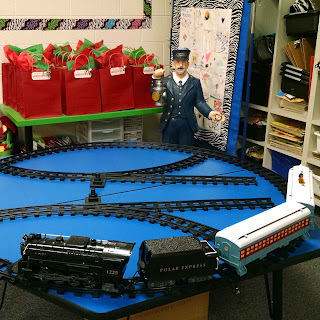 We had a Lionel Polar Express train running throughout the party. We had the movie soundtrack playing in the background throughout the party. 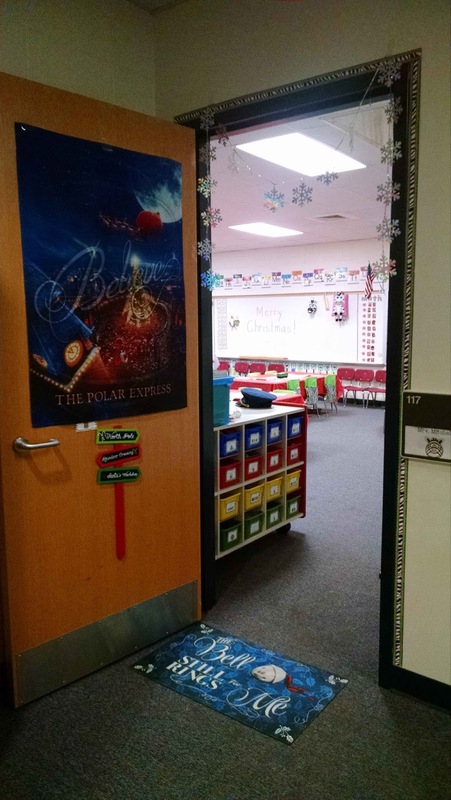 We had various Polar Express branded flags, mats and printables decorating the room. While the students were coming back from the program, Ted donned a conductor's hat, pocket watch and handed out "tickets" (ie "Believe" stickers that I purchased from Oriental Trading) to each passenger (ie student). As soon as the children got into the room, Ted read the Polar Express to the children from an oversized Polar Express book. After storytime, the children lined up for their special snack of doughnut holes, muffins, fruit and cheese. 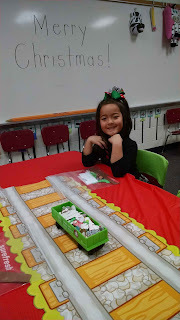 The best part of snack time was the hot chocolate bar (but of course!)!! While the kids ate, I explained the crafts (that the children could complete at their leisure). We made reindeer antler hats, picture frames (thanks to Mrs. Mitchell taking each student's picture ahead of time! ), and a Christmas card. Before the party, I went ahead and divided up all the supplies and put each students supplies in a large baggie and placed it at their desk (Type A, much?!). Everything went smoothly and I believe that all the students had fun!! All of the pre-planning and preparation paid off. We ended the party with a class picture in their reindeer antler hats. Oh, and each student got to take home a great goody bag full of fun Polar Express themed items and most importantly, a silver bell! 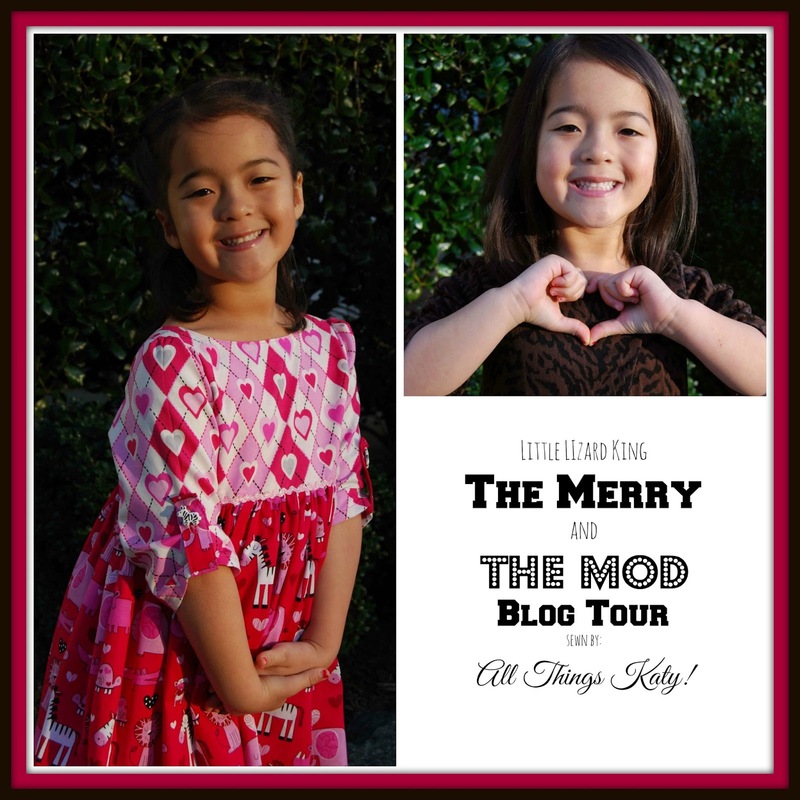 Little Lizard King- The Merry and The Mod Dresses go Zebra-licious! 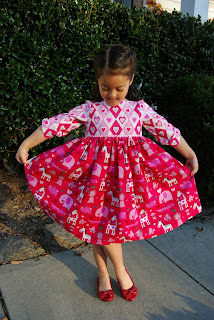 If you are active in the PDF sewing world, you have already seen the two new gorgeous releases for Little Lizard King. 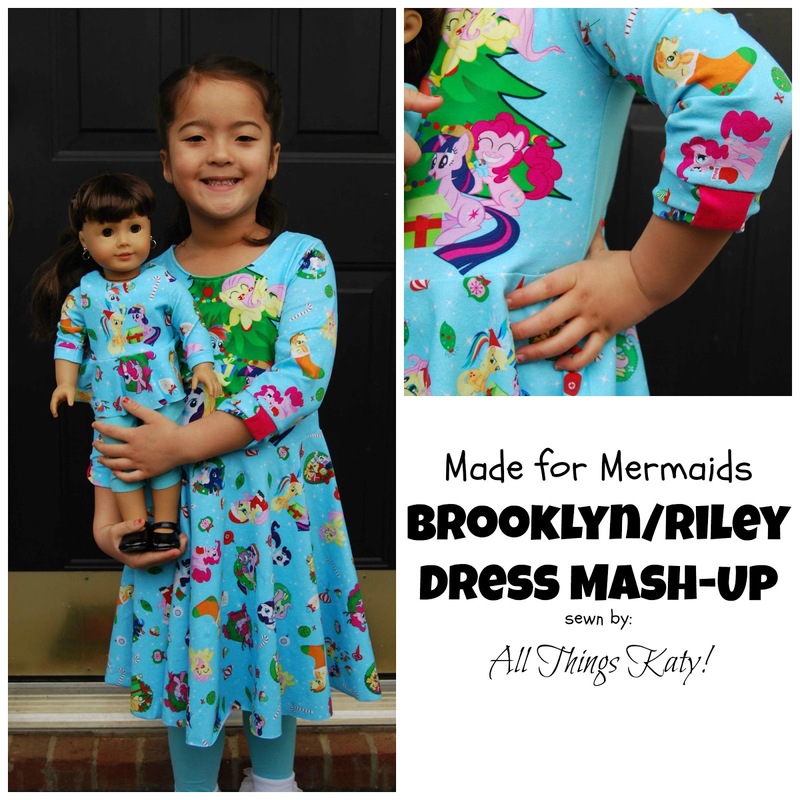 If not, it is my pleasure to introduce you to Little Lizard King's Merry and Mod PDF sewing patterns! 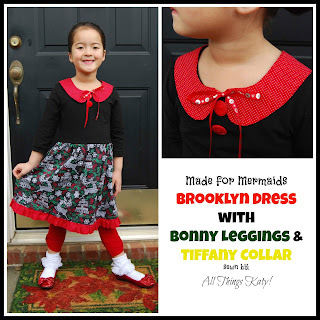 When I first sat down to start sewing these patterns, I looked through my stash of fabric. 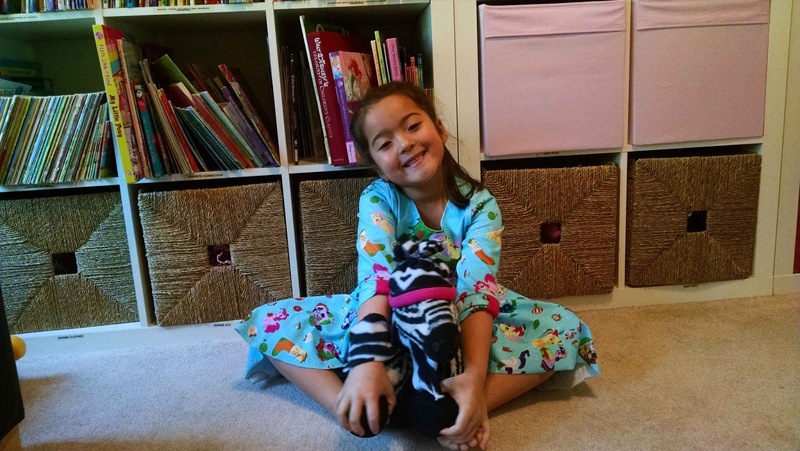 Ever since Lil' Miss started Kindergarten in the fall, we've accumulated quite a collection of zebra print/zebra character fabrics (her class mascot is the zebra). So, I decided to take the Merry and the Mod for a walk on the wild side- Zebra style! ;-) Here goes! First up, here is The Merry Dress! 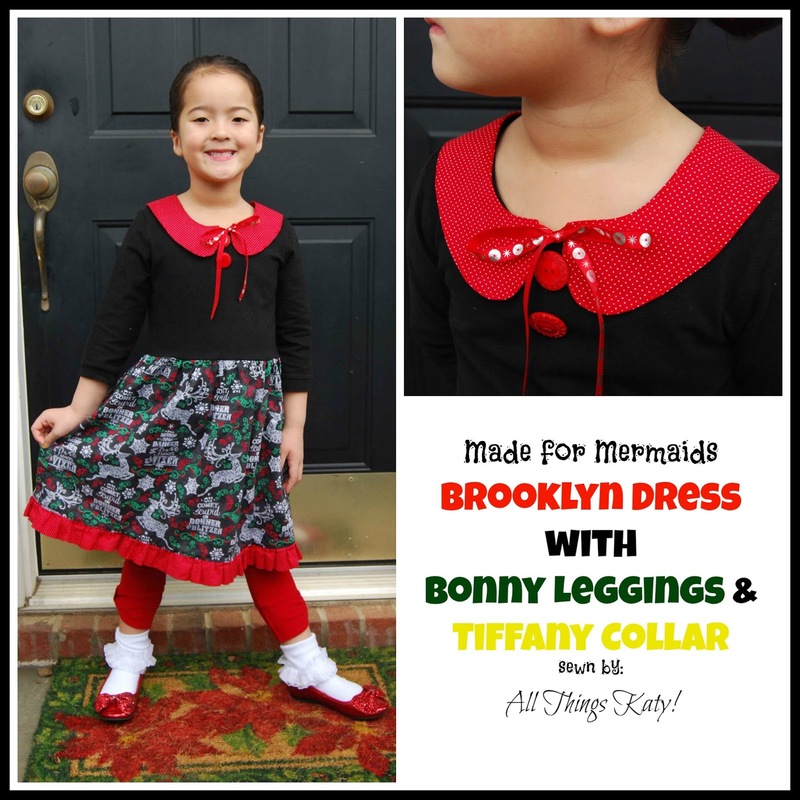 The Merry Dress, "...features a front boat neck bodice, full pleated skirt and a scoop back bodice with button closure. Various sleeve length options included." 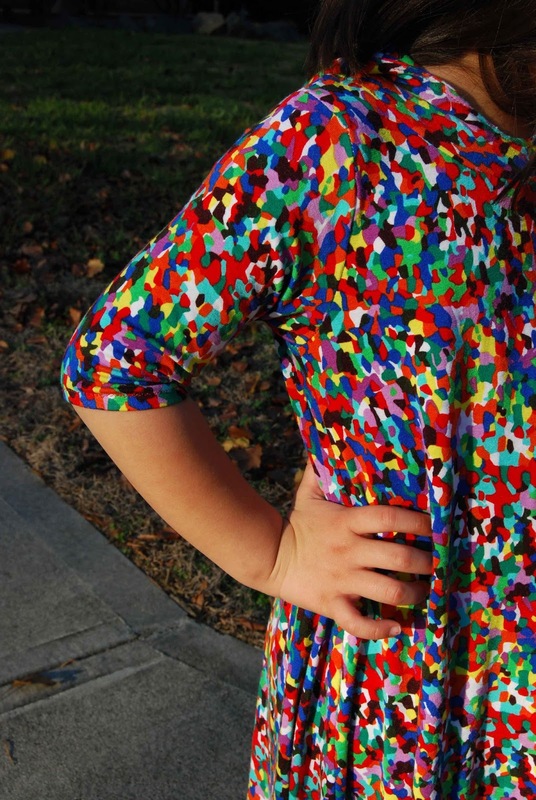 -The Merry Dress is drafted for girl's sizes 12m-12y. -The Merry Dress includes four sleeve lengths- cap, short, 3/4 and long sleeves. 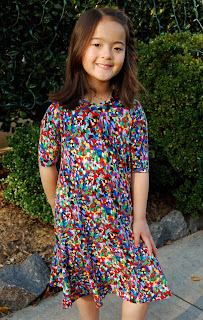 -The Merry Dress PDF sewing pattern includes a detailed description/instructions on how to pleat (really handy!). 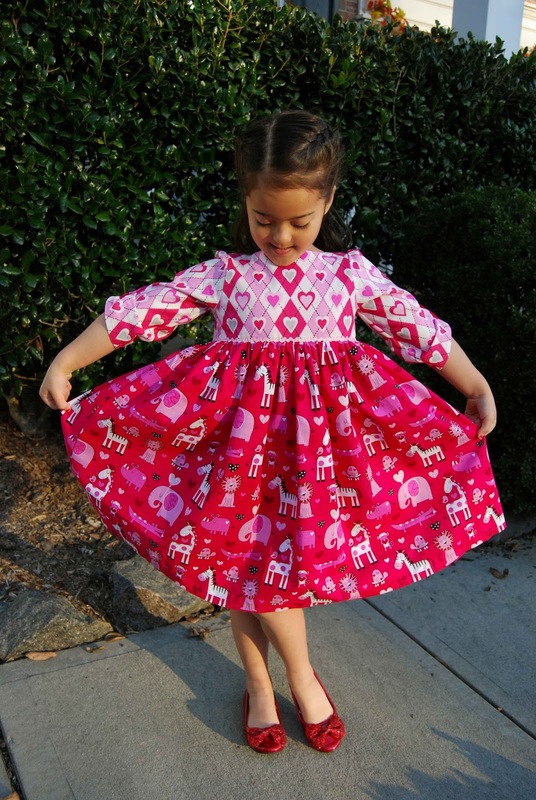 -The Merry Dress tutorial includes a fabric requirement chart, a sizing chart, a print layout diagram and a skirt cutting chart. -The Merry Dress tutorial features step-by-step photographs. 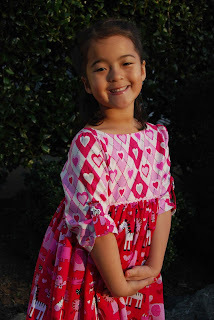 I sewed up a straight size six, 3/4 length sleeves Merry Dress. There is a finished measurements chart included in the pattern and this is really handy in figuring out what size to print for your little model. I especially appreciated the fact that the sizing chart included a finished arm length (very handy!). All cotton woven fabrics were bought locally at Hobby Lobby (forever ago!). Look at those cute zebras on the skirt fabric! -After reading some comments in the LLK Cafe Facebook Group (some members were asking how the Merry Dress would look with a gathered skirt), I decided to gather the skirt (opposed to pleating). One of the main features of the Merry dress is its pretty pleated skirt. By choosing to gather the skirt, I am deviating from the original design intent. 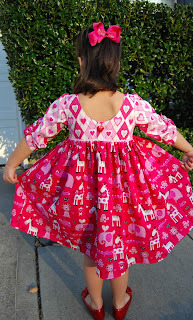 However, I wanted to show just how pretty the Merry Dress would look any way you chose to sew it up! :-) **I cut the the skirt pieces according the pattern for size six. Then, instead of pleating, I just ran a gathering stitch along the top. This created a nice, full skirt! 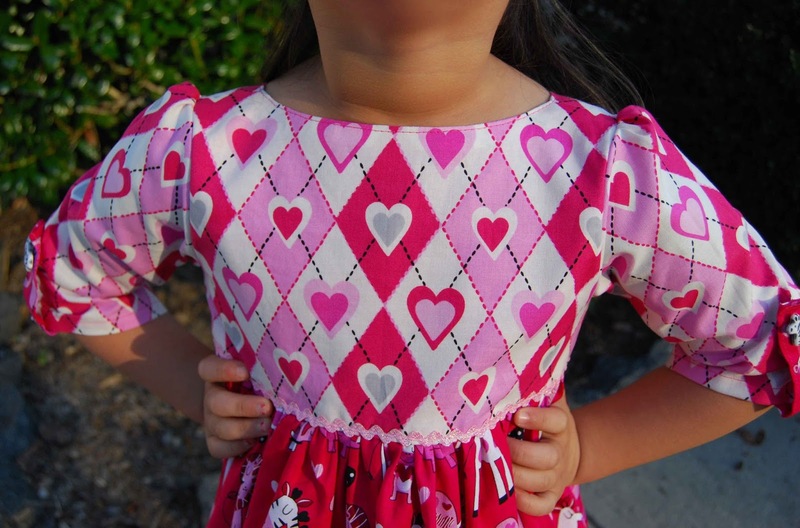 ** I also added a row of small ric-rack to where the bodice and skirt meet- such a sweet detail! Next up, the Mod Dress!! The Mod Dress is, "...A slim A-line, vintage length dress featuring angel wing style sleeves. Various sleeve length options included as well as the option of a button-down back closure or single button closure." 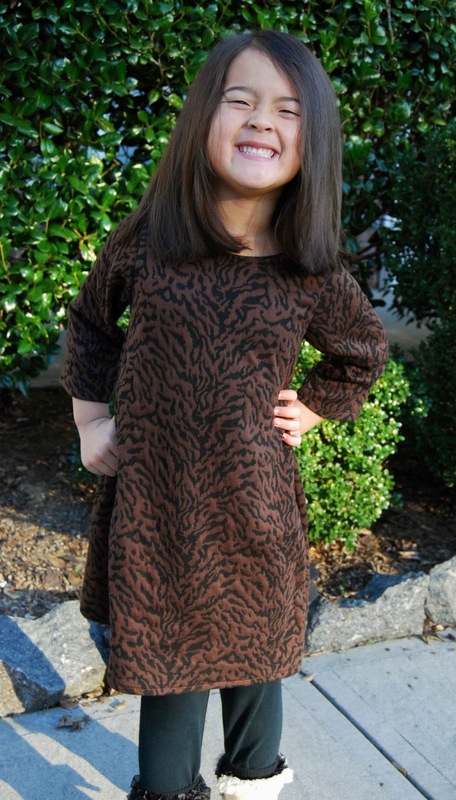 -The Mod Dress is drafted for sizes 12m-12y. -The Mod Dress includes pattern pieces for dramatic angel wing sleeves or, regular sleeves- cap, short, 3/4 or long sleeves. -The Mod Dress tutorial includes a fabric requirement chart, a sizing chart, and a print layout diagram. 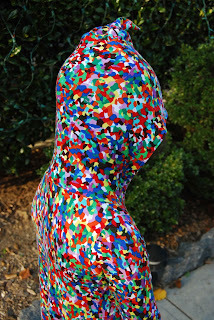 -The Mod Dress tutorial features step-by-step photographs. 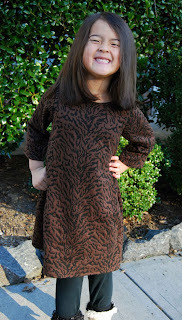 I sewed up a straight size six, 3/4 length regular sleeve Mod Dress in KNIT. 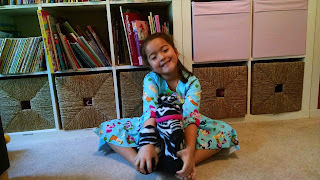 The zebra print ponte knit fabric was purchased locally at Hancock Fabrics (regular readers of All Things Katy! might remember that I recently sewed myself up a dress in the same fabric! Now, we are twinsies!;-). Because I used knit fabric, I eliminated the need for button holes- yay! The slight stretch in the knit allows the dress to be taken on/off by slipping it over the head. 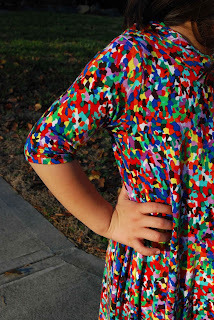 Sewing the Mod Dress in all knit made it so quick and easy to sew! So, so, SEW fast!! I think I sewed the Mod up in less than an hour on my serger! Whew! The a-line profile is flattering on most body shapes and uses minimal fabric (when doing the regular sleeve option- the angel sleeves will definitely take more fabric). Love, love, love a quick, easy and flattering sew!! 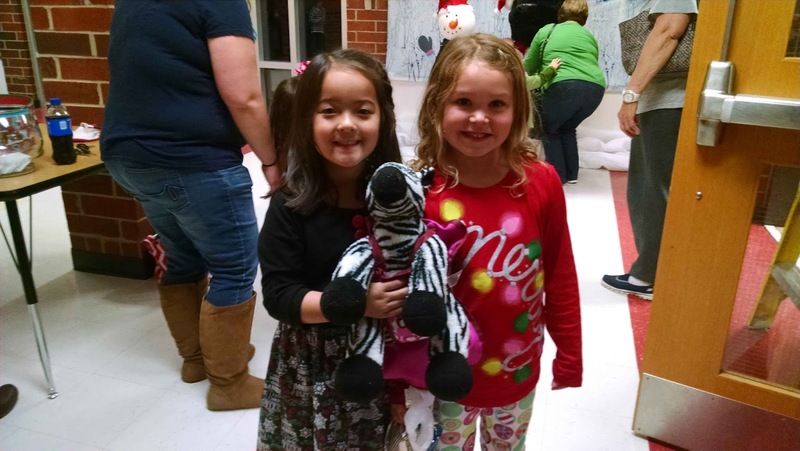 Zebra-licious! So, whether you choose to sew up Little Lizard King's the Merry or the Mod dress (or, both! ), you won't be disappointed! Thank you, Cassie, for sharing your talent and expertise with the sewing world with two great new patterns, the Merry and the Mod PDF sewing patterns! I had sew much fun!